Éadaoin Quinn is a school librarian at Enniscorthy Vocational College. She is one of thirty librarians working as part of the JCSP Library Project. A graduate of Trinity College and UCD, Éadaoin began her career as a librarian in third level academic libraries. In 2001 she left Trinity College Library to become one of the first JCSP Librarians. 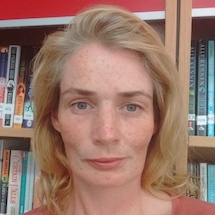 She loves her role a school librarian, engaging students with reading, supporting their learning and running a full programme of arts, culture and technology. When not pushing books on students she is hanging out with her family, or escaping them trail running and cycling. This course sounded like just what I was looking for: “Creative Writing in the Differentiated Classroom”, I was excited by the chance to be in Temple Bar in Dublin in the middle of Summer and better again to work from The Ark. As a school librarian, working in a Deis school as part of the JCSP Demonstration Library Project, I have been running an after school creative writing group for the past eight years. I am always looking for new ideas to inspire my students and to develop their writing. Too often I am looking for these bright ideas at the end of a long and tiring day. Poet Nell Regan delivered the course, as Nell has worked as a teacher and continues to teach writing to children, this was a course grounded in the reality of the day to day of school life and not high falutin theory. The course was fun and we deserved fun at the end of the school year, especially the primary school teachers who had only days before waved goodbye to their students. Practical playful activities were described by Nell from her experience, we were invited to try each exercise ourselves and then to reflect on how we would work it in to our classrooms or libraries. This generous sharing of ideas led to wonderful discussions among us. There was a great buzz and spirit of collegiality between all of us participants. It was especially interesting to share experiences between primary and secondary level. We had a lot to learn from each other and Nell having experience of both made the course relevant to all of us. The project room on the top floor of The Ark is a beautiful creative space, we explored it thoroughly during one exercise leading each other blind folded on a sensory exploration around the room and out onto the balcony (eek!). We were brought on a tour of The Ark’s exhibitions and learned of the rich programme of visual and performing arts. I found it a stimulating environment, just being there you felt creative. By Wednesday afternoon I was exhausted and was so happy to sit back and listen to Children’s author and guest facilitator Patricia Forde. Patricia was a ball of energy, she told a hilarious and personal story of growing up on Shop Street in Galway City and how she began to write. It brought home to me the huge influence an adult, especially a teacher or librarian, can have on a child’s sense of themselves as a writer. An engaging conversation followed on children’s and young adult’s books with much scribbling down of titles and authors. Nell organised a visit to The Chester Beatty Library on Thursday afternoon. We used the exhibits of the library as the stimulus for some writing and for ideas for Friday’s book making workshop. On Friday we were up to our oxters in glittery paper, glue and ribbon as we made our own notebooks. Having had trouble that week folding up my paper lunch carton from a nearby trendy café this was not an easy task. Some of the results were gorgeous, I’m filing it under “student led activity”. I’ve come away from the week with a stack of ideas, some “just hints” of ideas and some half fledged lesson plans. I have a list of online resources recommended by Nell and fellow participants and I have more confidence and enthusiasm for teaching creative writing next year.